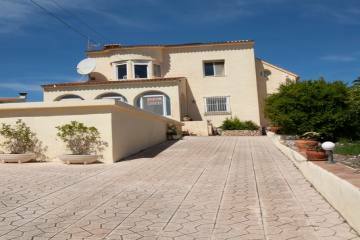 A superb Villa all on 1 level built covering 5 flat plots in the sought after Tosalet area of Javea. The villa has been completely reformed but has maintained its rustic charm. The accommodation comprises The main entrance leading from the open, covered terrace into the huge lounge/dining room which has a feature fireplace, a large equipped kitchen with a pantry and a utility room. There is also a guest WC and 4 double bedrooms each with ensuite bathrooms. There is a separate guest studio with a bathroom. The large, walled and fenced garden sports a lawn, fruit trees, a swimming pool and terraces, BBQ, tennis court and carport for several cars. The property is offered furnished. The house has the benefit of underfloor electric heating and hot/cold air conditioning. Restaurants and amenities are within 1 km and the gorgeous sandy beaches are 3 km away.